While Music Row is well known for its production of albums, hit singles and award-winning collaborations, neighbors can expect to hear more sounds of theatrical scores as Belmont’s Ocean Way Nashville becomes the premiere spot for video game score production. Nashville is no longer home to just country music stars and frequent live shows – the video game scoring industry has taken a liking to Music City and with Ocean Way at the helm, the recordings and their awards continue to stack up. Since its purchase by Belmont University in 2001, Ocean Way Nashville has become a leader in the music production industry, both locally and globally, and in recent years, the studio has produced a number of scores for popular games that have gone on to accumulate a number of national recognitions. At the 2014 GANG (Game Audio Network Guild) Awards, “The Last of Us,” a best-selling game with score composed by Gustavo Santaoello and recorded at Ocean Way, won Best Audio. In March 2014, the studio scored “Dragon Age Inquisition” by famed composer Trevor Morris, which went on to win the 2015 D.I.C.E. Awards Game of the Year. Past Ocean Way Client Services / Assistant Engineer and Belmont alumni Nick Spezia would agree. Spezia said the opportunity to have a hand in recording diverse projects like an orchestral game score allowed him to think critically, solve unique problems and creatively engineer a final product. “Working on these sessions has been a continual learning process. I’d like to think that one of my biggest roles is finding ways to accommodate everything from the first initial point of contact, through final delivery of assets. I’ve also learned that despite planning everything in immense detail well in advance of these sessions, I still have to think on my feet.” Spezia said. With a city deeply rooted in music, production and the art of creativity, McMakin said Nashville’s music business will have to adapt based on the changes facing the industry. Online downloads, file sharing and streaming have re-set the stage for Music City and as one of Nashville’s premiere studios, Ocean Way is eager to jump into the change. “It’s about survival. It’s about keeping our existing assets, both human and physical, vital and healthy,” McMakin said. As a commercial studio that doubles as a large learning lab for Belmont’s Curb College music business students, this recognition is key. 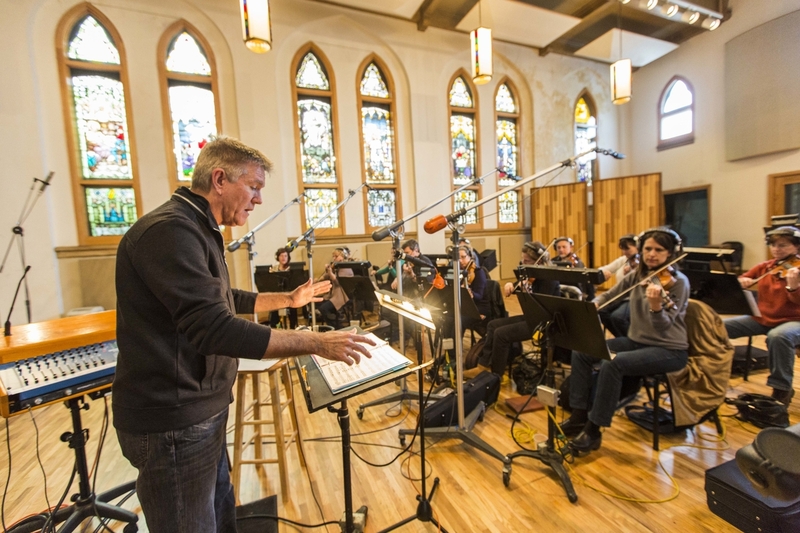 “Not only do students have the opportunity to help with setups of these large orchestra sessions, but also as Ocean Way Nashville’s name is more widely recognized, so will Belmont’s. Our goal is to constantly leverage Ocean Way for the benefit of our graduates as well as our current students,” McMakin said. For more information on Ocean Way and its projects, visit their new website here.